CHEEK PAD SIZE. SHELL SIZE. ARAI- DEFIANT. Reference model: ARAI - ECE REBEL; USA DEFIANT; JAP RAPIDE-IR". Outside SFL (Super Fibre Laminate). Flares out for easier putting on and taking off. The shell is made of SFL fiber, comfortable and lightweight with extra strengthening ribbing. Ducati Scrambler Green Necker. SORRY BUT FOR ORDERS OUTSIDE THE U.K. WE DO NOT ACCEPT CREDIT/DEBIT CARDS. The shell of glass - and carbon-fiber ensures strength and lightness, while the removable, washable, antibacterial-treated Interior ensures great wearing comfort. For the Sport-touring use. Sight Transparent polycarbonate visor, scratch-resistant anti-fog system Tinted visor, including Microwave opening system of the visor. SFL (Super Fibre Laminate). Super fibre provides more comfort than other shell materials, yet is still strong and lightweight Ergonomic shape. DUCATI CORSE. HARLEY DAVIDSON / DUCATI. FFS (Free Flow System). It has a few scuffs and scratches. The visor is dark and has surface scratches and mainly on the left side. It also has six pieces of dark tape which also looks like reflector tape but not sure. It has a label indicating 2/2005. Made by ARAI Model Tour -X4. SFL (Super Fiber Laminate). Hyper Ridge. Marke Ducati. Polystyrene in a single multi-density shell Facial Contour System (FCS). The cheek pads covers the jaw and cheekbones, and not just the cheek area. Internal sun visor. Material: injection molded carbonglass (fiber glass carbon fibre) interior fabric Dry Comfort. MPN 981036816. EAN Non applicabile. Colore principale Nero. ARAI CORSAIR-X. With neck exhaust to enhance hot-air extraction from the interior. Air suction from eye port to side duct Ventilation with new slide shutter: reduced wind noise, improved durability and waterproofing. TheDucati Corse V2, based on theArai Corsair-X. Arai Side Air Channel. SNELL M2015. Racing closure with D-ring fastening. Diffuser with improved aerodynamics for high-speed stability and drag. Pro Shade System. Racing closure with D-ring fastening. Super Fiber Laminate. DUCATI Corse Suomy Helmet xl in great condition never dropped used a hand full times I have may helmets decided to sell this one. Original Ducati Warm Up balaclava. Modern and functional, the new Balaclava Warm Up protects the neck, temples and chin wind. The slight compression and construction with ribbing at neck optimize fit, prevent heat loss and isolate externally. Super fiber provides more comfort than other shell materials, yet is still strong and lightweight. Flares out for easier putting on and taking off. SuperAdSis LRS (Lever Release System): Makes visor changes possible in seconds, without tools or removal of the side pods. ScLc (Super complex Laminate construction) 40% stronger than standard fiberglass in extension and bending resistance. Two layers of Super Fiber, one middle layer of special fiber. The middle layer consists of a very special material, a very strong and light chemical fiber exclusive to Arai. CODE : 981047064. MPN 981047064. Born on the top of the range model racing < span class = "notranslate" > X-lite, X-803 Ultra Carbon Ducati Speed Evo. Effective ventilation system RAF (Racing Air Flow). ScLc (Super complex Laminate construction) 40% stronger than standard fiber glass in extension and bending resistance. Two layers of Super Fiber, one middle layer of special fiber. The middle layer consists of a very special material, a very strong and light chemical fiber exclusive to Arai. Arai Side Air Channel (ASAC). Air suction from eye port to side duct. Facial Contour System (FCS). With neck exhaust to enhance hot-air extraction from the interior. Ventilation with new slide shutter: reduced wind noise, improved durability, and waterproofing. 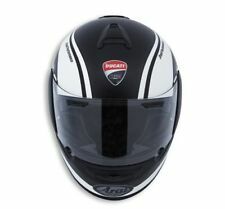 Ducati Motorcycle Helmet Drudi Performance. Only worn 2-3 times. From dealer and home. From home to dealer. No scratches. Excellent condition. Ducati Corse Scarf black / red / white. Marke Ducati. 100% POLYESTER. 24 x 46 cm.